Questions on our journeys and destinations? Meeting the people behind Papillon Reizen? Looking for a beautiful African fair-trade gift? Or longing to feel like you’re in Africa with great music and food? 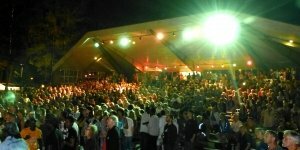 On Saturday 6 and Sunday 7 July the 25th Afrikafestival in Hertme (The Netherlands) is the place to go! The jubilee edition of this festival promises to become a true spectacle with the crème de la crème of the African music scene, including Mali’s Salif Keita and Bassekou Kouyate and Fanfare Eyo’nlo from Benin. We invite you to visit our booth in the market section for extensive information on our journeys on offer, to meet Papillon’s crew and for beautiful African fair-trade handicrafts. At least 10% of the sales of handicrafts will be donated to the Papillon emergency fund, to support the people in Mali. Extensive information on the Afrikafestival and the line-up is available at the official festival website. Looking forward to meeting you in Hertme!